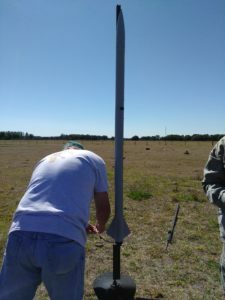 Home » Category "Hybrids 2017 – 2018"
On Saturday March 17th, 2018 our high powered hybrid rocket, The Raging Bull, was test launched for the first time in order to get ready for the upcoming NASA Florida Space Grant Consortium Hybrid Motor Rocket Competition, FSGC for short. 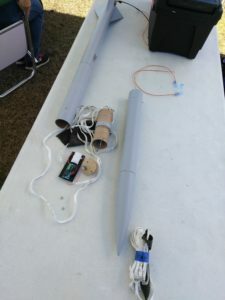 A hybrid rocket is one that has solid fuel and a gaseous oxidizer, in our case we use PVC and Nitrous Oxide. Before the launch the rocket is filled with gas and then the PVC is ignited. The Raging Bull was successfully recovered after it was launched to an apogee of 2116 feet, only 116 feet away from the goal!